I love the autumn mist. The landscape changes and where you once have been able to see the high peeks form a far you can hardly see where the next house is located. The land seems to be enchanted, and I don't think of any ghostly creatures or monsters, but a fine spell that has been cast over the whole countryside. 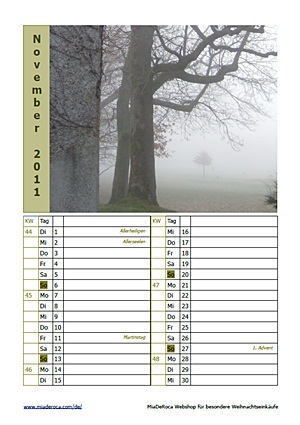 Preview Kalenderblatt November: a walk in the mist, the historic gate at the old Caslte Street in Rif, between Salzburg and Hallein (the picture shows the German version of our calendar). I like the thick afternoon fog, which is floating in the valleys like a soup and I love the morning mist, which is every now and then torn apart by the sunlight and opens new perspectives to known buildings. To be honest - we are very fortunate as beautiful Salzburg allows us to find beauty in every season. The photo we chose for our calendar sheet is taken from a pathway in Rif, which is located between the city of Salzburg and Hallein. The traditional side dish of a Martin's goose is red cabbage and Knödel (dumplings). Semmelknödel (bread dumplings) can be made at home: find our recipe for Austrian Knödel. After the feast of the Martin's goosenull has been turned into muscles when on long autumn and maybe the first trips of cross-country skiing, we get prepared for the next holidays. The first of advent 2011 is on November 27th, on this Sunday we light the first candle of the advent wreath. You can make yourself an advent wreath - use a hoop and arrange the twigs of fir around it, attach it with wire. You need as well 4 nice candles, big enough so that candle number one will still be big enough on December 24th when the fir will only be dry sticks (and could burn easily). Decorate your advent calendar the way you like with dry spices like cinnamon and star anise or some glittering chains and self made decorations of salt dough. Autumnal Shopping Bag with Hare and Pheasant.